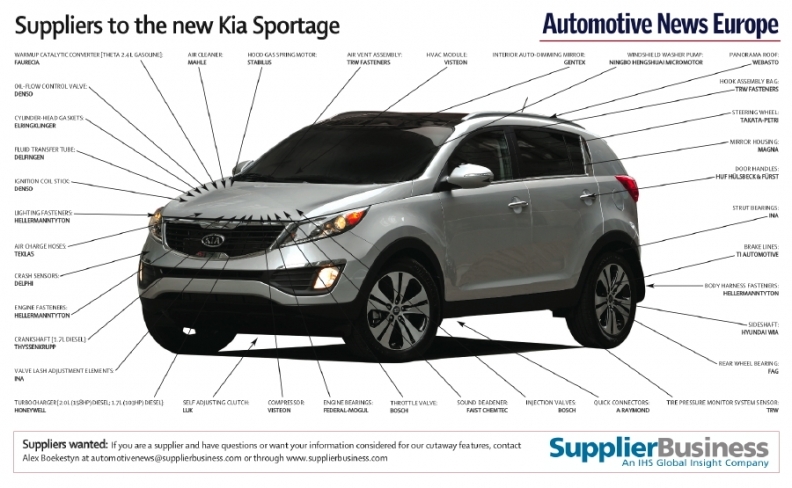 The Kia Sportage is leaner and greener thanks to contributions from Denso Corp. and ElringKlinger AG. Denso of Japan provides the Sportage’s optional stop-start system, which cuts power to the engine when the medium SUV is stopped at a traffic light. Denso also supplies the SUV’s dual CVVT (continuously variable valve timing) for both the intake and exhaust valves and the oil-flow control valve to the vehicle. The contributions help cut the SUV’s 2.0-liter diesel’s CO2 emissions to 147 grams per kilometer from 187g/km in the equivalent model from the previous generation. The Sportage’s 2.0-liter gasoline version goes from 194g/km to 177g/km. Weight is saved in the Sportage by using all-aluminum construction in its gasoline engine with a cast aluminum block, cylinder head and sump. The cylinder head gaskets are supplied by ElringKlinger of Germany. Overall, the new Sportage’s weight was cut by 91kg compared with the last-generation model. The SUV also is available with either a new 1.7-liter diesel or a 1.6-liter gasoline version, both of which are being introduced in the updated Sportage. Kia manufactures the Sportage at locations in eastern Europe and Asia. Starting in 2012, all production will be on a unified platform and model code. In eastern Europe, the Sportage is built at Kia’s plants in Zilina, Slovakia and Kaliningrad, Russia. Peak production is forecast by IHS Automotive to be 88,000 in 2013 and 2014, while combined global production volumes will continue to rise through to 2017 thanks to increasing production at the company’s plant in Yancheng, China.